Johan Franzen. Jersey Card# 138. Nunavut (NU):--------------------5.00%. Prince Edward Island (PE):---15.00%. "Mirror Blue". 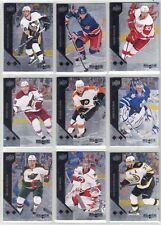 2011-12 Panini Certified NHL Hockey. First Card. •Orders may be. 2011-12 Johan Franzen UD Game Used Jersey Card Detroit Red Wings #GJ-JF The card you see is the card your getting. I'm sorry for the poor condition that the case is in but the card is in excellent condition. Please look closely at the pictures and grade it for yourself, however I would say this card is in excellent condition! I have a huge Red Wings card collection and will be listing some of them over time. I would be able to do a better price on some by selling multiple cards together. Also selling other items and can ship together if your interested in anything, take a look! Feel free to ask any questions - Thanks for looking!